BMW recently released the details about its 2013 BMW 640D xDrive Coupe, which is one hell of a car that will surely make a few heads turn when it finally comes out. If you ever wanted a car which looks great, has a powerful engine, comes with great performance and gives good fuel economy then this beast from BMW is surely going to fulfill your requirements to a great extent. Powered by a 3.0 liter TwinPower Turbo Inline-six diesel engine, the 2013 640D xDrive is one powerful machine on the road. The engine is capable of giving a max output of 313 HP and 465 lb-ft torque at as low as 1500rpm. From this statistics alone you can imagine the power of the engine the 2013 640D possesses. It is only obvious that with such a powerful engine in its belly, the car will give some astounding performance on the road and it does. 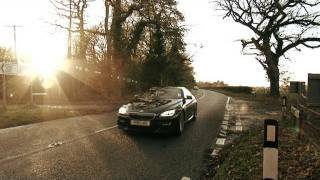 The BMW 640D is capable of reaching the speed of 62mph from zero in just 5.2 seconds. Use of TwinPower Turbo technology in the engine not only gives eye popping performance figures to the car, but it also ensures a “greener” ride for the riders. Fuel economy of the 2013 BMW 640D stands in between 48.7 and 49.6mpg, while CO2 emission stands at 149 to 153 grams/km. The smart xDrive system ensures a perfect four-wheel drive condition by distributing power from the engine in all the four wheels of the vehicle. On the other hand, the Dynamic Stability Control system (DSC) ensures optimum traction even on low-grip surfaces and gives the car excellent performance while turning corners as well as an all-weather capability. Apart from that standard features on the car include things like automatic start stop function, Brake Energy Regeneration, active air flap control and need based ancillary unit operation. The car comes with a Driving Experience Control which allows the driver to change in between sport, sport+, comfort, comfort+ and ECO PRO mode. The car performs differently in all these different modes. On the inside, the 2013 640D is extremely spacious and can seat 4 adult passengers in the most luxurious ambience one can imagine. Standard features on the inside include 2-zone automatic climate control system, electric steering column adjustment, multifunction steering wheel, automatic headlight range control, a rain sensor, HiFi audio system and much more. 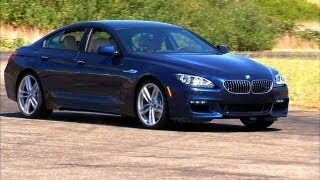 The 2013 BMW 640D will only be launched at the European market for the time being. Right now, BMW has no plans of bringing it in the United States. Munich. BMW is set to add another variant of the Coupe and Convertible to the BMW 6 Series line-up with the arrival of the BMW 640d xDrive Coupe and Convertible in spring 2012. Intelligent all-wheel drive – making its debut in the BMW 6 Series – teams up with a six-cylinder in-line diesel engine featuring BMW TwinPower Turbo technology to take driving pleasure to another new level. The combination of a diesel engine and BMW xDrive all-wheel drive, which will also be found in the BMW 640dxDrive Convertible, gives the BMW 6 Series a spread of abilities none of its rivals can match. 100 kilometres / 48.7 – 49.6 mpg imp (in the EU test cycle, depending on the tyre format), while CO2 emissions are 149 – 153grams per kilometre. Six-cylinder in-line diesel engine with BMW TwinPower Turbo technology in the BMW 6 Series. The instantaneous responses and pulling power of the diesel unit fitted in the BMW 6 Series enable it to do everything required of an engine fitted in a car with a sharp sporting focus. The output characteristics, acoustic profile, low vibrations and efficiency of the six-cylinder unit offer clear evidence of BMW’s expertise in the development of diesel engines. 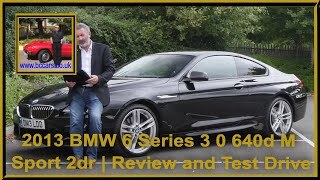 Rewinding a generation, the introduction – for the first time – of a diesel variant into the previous BMW 6 Series likewise lent an extra dimension to the range. The new BMW 6 Series adds further lustre to the alluring profile of the exclusive and sporty, yet also economical, premium-class Coupe by taking performance and efficiency to new heights and, for the first time, offering the additional benefits of xDrive. The latest generation of the most powerful diesel engine boasts displacement of 3.0litres, a low-weight all-aluminium crankcase and the latest development of BMW TwinPower Turbo technology. This package of technology comprises multi-stage turbocharging and common-rail direct injection whose piezo injectors work with maximum pressure of 2,000bar. The car’s two-stage turbocharging generates instantaneous and forceful power delivery, while the injection system sprays the fuel into the cylinders in precisely measured quantities to ensure clean and efficient combustion. Two-stage turbocharging with optimised efficiency. The latest multi-stage turbocharging technology responds more precisely than ever to the demands of different driving situations. At low revs a smaller turbocharger is activated, its low moment of inertia allowing it to go to work extremely rapidly. The compressed air from this small charger is sent directly to the combustion chambers via a bypass line. As the air no longer flows through the large charger, loss-free development of charge pressure is assured. Only when the driver asks for more power do the electronics prompt the bypass unit to bring the larger turbo into play. Added to which, variable turbine geometry for the smaller of the two turbos optimises the effectiveness of the turbocharging system in responding to the power requirement at any one time. The result is an ultra-fast response to every movement of the accelerator. The engine delivers its peak torque of 630Newton metres (465 lb-ft) as low down as1,500 – 2,500rpm, with maximum output generated at 4,400rpm. Powerful acceleration from a standstill and dynamic mid-range sprints are therefore dispatched with equal ease. The eight-speed Sports automatic gearbox is tuned precisely to the performance characteristics of the engine, and so allows the driver to exploit its impressive torque – maintained across a high rev band – to the full, for a sporty yet smooth driving experience. By contrast, in ECO PRO mode (likewise standard) the power reserves of the sporty diesel engine play a prominent role in ensuring a relaxed and extremely efficient driving style at low engine speeds. BMW EfficientDynamics package of technology and Driving Experience Control come as standard. ECO PRO mode, which is activated via the standard-fitted Driving Experience Control switch, carries out adjustments to the engine management, accelerator mapping and the shift characteristics of the automatic transmission. In addition, the output of electrically operated functions such as the climate control system, as well as the seat and exterior mirror heating are carefully regulated to ensure extremely efficient energy management. Special displays inform the driver of the extra range, in kilometres, achieved as a result. The BMW EfficientDynamics technologies fitted as standard on board the BMW 640d xDrive Coupe also include Brake Energy Regeneration, the Auto Start-Stop function, need-based operation of ancillary units and active air flap control. The Driving Experience Control switch can also be used to call up SPORT, SPORT+ and COMFORT modes, and – if the optional Dynamic Damper Control or Adaptive Drive are selected – COMFORT+. As well as the accelerator progression, engine responses, power steering characteristics, intervention thresholds of the DSC stability control system and shift dynamics of the automatic transmission, this also allows the driver to adjust the damper settings and anti-roll control. Whichever mode he chooses, the driver is activating a pre-configured and coherent overall set-up which includes reproduction of the engine sound. Here, a sound module is used to enhance the engine’s natural acoustic components to suit the driving situation and the Driving Experience Control mode selected, and this soundtrack is then transferred into the interior. The system’s digital signal processing technology exchanges data directly with the engine management and adjusts its output to the engine’s revs, the amount of torque being produced and the car’s speed over the road. This gives the driver an impressively accurate impression of how hard the engine is currently working and of the power being unleashed, and provides an even clearer window into the car’s responses on the road. Intelligent all-wheel drive raises driving pleasure another notch. BMW 6 Series range adds another alluring dimension to the driving experience on board a top-class premium coupe. The BMW 640d xDrive Coupe showcases the latest incarnation of the intelligent all-wheel-drive system. In addition to the variable transfer of power to the front and rear wheels, this technology also includes Performance Control, which divides drive between the right and left-hand rear wheels to suit the situation at hand. ICM (Integrated Chassis Management) system enables all situations on the road to be identified and evaluated to allow the necessary control interventions to be made at an early stage. These can be carried out by xDrive either on its own or in combination with Dynamic Stability Control or Performance Control. The power is distributed quickly and with great precision to where it is needed, ensuring that the driver enjoys the handling characteristics expected of a BMW – even under extremely dynamic cornering. The xDrive system has been specially tuned for service in the BMW 6 Series, taking into account the car’s specific properties and characteristics. This bespoke set-up is underpinned by the principle of blending the traditional rear-wheel-drive qualities of BMW cars harmoniously with the benefits of distributing power between all four wheels. As with every all-wheel-drive BMW, 60per cent of the engine’s power is sent to the rear axle in normal conditions and 40per cent to the front wheels. This torque split can be adjusted in an instant to suit changing conditions. Linking up to allow proactive analysis and precise interventions. Identifying the risk of traction loss at a very early stage allows wheel spin to be prevented at one or more wheels by varying power distribution. xDrive can therefore be described as an “intelligent” all-wheel-drive system. This proactive analysis of the driving situation takes into account the data from the engine management system and information on accelerator position, steering angle, wheel speeds and lateral acceleration stored in the ICM system. Based on this extensive information, xDrive is able to finely control the distribution of power between the front and rear wheels to ensure that engine output is fully utilised at all times. This allows xDrive to nip oversteer or understeer in the bud – unlike conventional all-wheel-drive systems, which only react when at least one wheel is already spinning. If the car is threatening to understeer, a greater proportion of drive power is immediately sent to the rear wheels.This makes for sharper turn-in on the entry to a corner; in other words, xDrive improves stability before the driver is even aware of the need. Similarly, the system’s proactive capabilities allow it to correct oversteer tendencies at the earliest possible stage by directing surplus power to the front wheels. That means the benefits of all-wheel drive can be enlisted even before traction loss actually occurs. Intelligently varied power distribution also has benefits for ride comfort; due to the stabilising effect of xDrive, DSC now only needs to intervene in extreme situations. Only when optimal drive power distribution alone is insufficient to keep the vehicle on track does DSC intervene by reducing engine power and selectively braking individual wheels. Electronic control enables extremely rapid reactions. The xDrive system’s electronic control system allows the power split between the front and rear wheels to be altered almost instantly to suit changing driving conditions. It does this by adjusting the multi-plate clutch in the central transfer case, using a stepper motor. The higher the pressure on the clutch plates, the more power is transferred to the front wheels via a gear system. Conversely, when the clutch is completely open, all power goes to the rear wheels. The electronic control system is capable of varying the torque distribution in record-quick time: it takes just 100 milliseconds to fully open or fully close the clutch. Performance Control improves these driving dynamics even further. Working with the xDrive control function, this electronic system uses precisely controlled braking and variable torque distribution to counteract the onset of understeer on low-traction surfaces and under particularly dynamic cornering, thereby improving agility. As soon as understeer is detected, the integrated electronic control functions of xDrive and DSC selectively brake the rear wheel on the inside of the corner. The resultant loss of propulsion is compensated for by an increase in drive power. BMW xDrive now also destined for success in the BMW 6 Series. all-wheel drive has developed from an option initially limited to selected models to a growth driver for the ongoing expansion of the model range. The worldwide success of xDrive has also been aided by the introduction of the BMW Xmodels. With the BMW X5, BMW X6, BMW X3 and BMW X1, the range now includes four models which set the benchmark in their segments in terms of agility and driving pleasure. In these models, as elsewhere in the BMW range, the all-wheel-drive system not only gives drivers a traction and stability advantage, but also plays a key role in delivering stand-out dynamic performance. Alongside the triumphant progress of the BMW X models, the number of all-wheel-drive variants in other model series has also grown consistently. Today, xDrive models can be found in the BMW 3 Series, BMW 5 Series, BMW 7 Series and now, for the first time,the BMW 6 Series range. BMW 650i xDrive Coupe. In this model, xDrive divides the power generated by a V8 engine with BMW TwinPower Turbo technology between the front and rear wheels. The power unit underneath the bonnet of the BMW 650i xDrive Coupe develops maximum output of 300kW/407hp and peak torque of 600Newton metres (443 lb-ft), and again links up with the eight-speed Sports automatic gearbox. With the added benefits of xDrive on board, the car can sprint from 0 to 100 km/h (62 mph) in 4.8seconds. 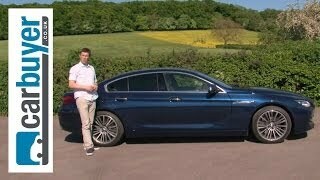 BMW 6 Series Coupe offers greater variety. BMW 640d badges), a choice between BMW’s traditional rear-wheel drive and intelligent all-wheel-drive technology, state-of-the-art chassis technology and an array of innovative and – in some cases – unique equipment features, BMW brings an exclusive product package to the premium luxury-class coupe table. The new BMW 6 Series Coupe can also be equipped with a specially developed M Sport package. The aerodynamic, exterior and interior components designed in familiar M style clearly showcase the sports car character of the 6 Series Coupe. Equipment includes an M aerodynamics package with bespoke body components for the front end, side sills and rear apron, exhaust tailpipe embellishers in Chrome Dark, LED front fog lamps and 19-inch light-alloy wheels in Mdouble-spoke design. 20-inch light-alloy wheels in Mdouble-spoke design can also be ordered as an option. Inside, features such as M-specific Alcantara/leather sports seats in Anthracite with Blue contrast stitching, an Mleather steering wheel with multifunction buttons and gearshift paddles, and Aluminium Hexagon interior trim strips all play their part in creating a full-blooded driving experience. The M Sport package also includes door sills bearing the Mlogo, as well as an Mdriver’s footrest. The BMW 6 Series Coupe offers seating for four immersed in a luxurious ambience, while its 460-litre boot can accommodate three 46-inch golfbags or two medium-sized hard-shell suitcases plus a flight case. The comfort-enhancing equipment fitted as standard in the new BMW 6 Series Coupe includes 2-zone automatic climate control, a multifunction steering wheel, electric steering column adjustment, electrically adjustable and heated exterior mirrors, Cruise Control with braking function, a rain sensor with automatic headlight range control, a HiFi audio system and the control system iDrive with a freestanding Control Display in flatscreen design. Among the highlights on the options list are Adaptive LED Headlights and the Bang & Olufsen High End Surround Sound System. BMW ConnectedDrive also help to give the new BMW 6 Series Coupe its innovative character. Enhancing convenience during a journey, for example, are services such as a personal assistant who is at your service around the clock and searches for addresses, inputting them as destinations directly into the navigation system. The Real-Time Traffic Information function, meanwhile, transfers extraordinarily precise data and diversion recommendations to the navigation system. 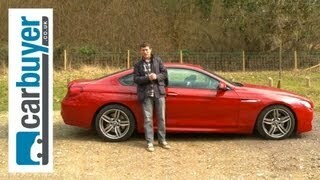 BMW 6 Series Coupe. And the office functions enable calendar entries, for example, or e-mails on a smartphone to be shown in the vehicle display and read out to the driver. ConnectedDrive features also help to improve safety. The new-generation BMW Head-Up Display offers optimised display quality, with a full spectrum of colours now available for the graphics, allowing extremely realistic-looking symbols to be projected onto the windscreen. Other functions include Advanced Emergency Call with automatic position finding and accident severity detection, BMW Night Vision with pedestrian recognition, the Lane Change Warning System and the Lane Departure Warning System.